I know some of you may find this hard to believe, but here goes. It’s not that easy to get middle-schoolers interested in history. It’s so . . . yesterday. And then authors like Margo L. Dill come along with finely-researched and gripping historical fiction like Finding My Place: One Girl's Strength at Vicksburg and teachers can breathe a happy sigh of relief. But you don’t have to be a teacher to sigh happily over Finding My Place. There’s plenty for everyone to like in Dill’s authentic and plucky thirteen-year-old protagonist, Anna Green, and her riveting story about the 1863 Siege of Vicksburg. In Anna’s Civil War tale, we’re grabbed from the first page and taken on a journey beyond the battlefields where Rebels and Blue Bellies fight. Anna brings readers to the emotional heart of life during the War Between the States. Finding My Place literally starts with a bang. Grant’s army is desperate to take the advantageously-situated city of Vicksburg, and so the local citizens have retreated to caves built in the surrounding soft clay hills to escape constant shelling. We feel Anna’s anguish as she, along with her mother and siblings, rush to take cover and wait to see what their future will be. We learn that Anna fears for the safety of her older brother and father, who are fighting in General Lee’s army. And then unbearable tragedy strikes, and Anna is forced to somehow find a way to keep her hurting family together, all the while trying to find her own place in this new and harrowing world that used to be home. I so love this young heroine, Anna. She’s courageous, yes, but she struggles with her fears and the deprivations of siege conditions in the way that any thirteen-year-old would. She’s challenged by constant doubts, and yet she finds the determination to do what needs to be done. Anna’s voice carries the story with adolescent honesty, whether she’s describing the horrors of a Civil War hospital, the possibility of eating rats, the inhumane treatment of a neighbor’s slave, or the awakening of feelings she has for a certain handsome young man. I’m a big fan of historical fiction. I love finding gems of information, the fascinating tidbits left out of the history books. And I especially like when a well-crafted, believable story brings history alive for me. Margo L. Dill has done a great job of providing both in her debut novel, Finding My Place. Educational resources are included, making this novel an excellent addition to the classroom library as well as the home library. It’s an adventurous read with true-to-life characters and compelling Civil War history that middle-schoolers, boys or girls, will enjoy. And P.S. Even the rather mature way-beyond-middle-schoolers who love history can learn something new in Finding My Place! If Margo L. Dill sounds familiar that's because she's contributing editor of WOW! Women On Writing, as well as a columnist, blogger, and instructor. We're so excited about her debut novel, and she graciously provided a copy for giveaway! Enter the Rafflecopter form below for a chance to win. 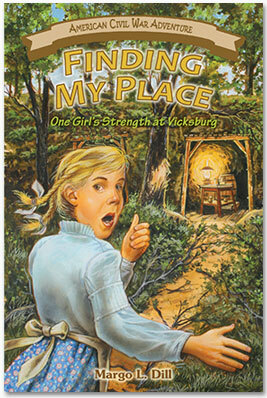 Finding My Place: One Girl's Strength at Vicksburg makes a great gift for middle-schoolers this holiday season. The contest closes December 6th. If you don't win, you can pick up a copy at Amazon or an autographed copy on her website. Good luck! I still remember a book I read in 5th grade about the Revolutionary War couched in a fiction book. As an adult, I read Barbara Kingsolver's book,"The Lacuna" and was so intrigued by her description of Frida Kahlo,I read an additional biography of this intriguing artist. Yes, books--especially fiction-- have the wonderful capacity to paint pictures and create vivid and memorable learning opportunities. Hope this book flies to success with kids. WOW! Thank you, Cathy, for the nice review, and Angela for allowing me to be featured on the blog I so love. :) I appreciate all your kind words. Some people have asked me how young the readers can be--the publisher recommends 9 to 12 (or 13) year olds--third through sixth (or seventh grade). There are a few sad things that happen--it is a "war" book. My friend who is a teacher read it to her third graders, and they liked it a lot--but she said some of them were near tears a few times. Just wanted to let everyone know that. :) THANK YOU, again! Dying to read your book. Being from Pa my kids read chapter books about Gettysburg in school but Vicksburg would be something new. Ladies, I fixed the Rafflecopter form. A reader e-mailed to say there was a box you had to write something in, but that's gone now and all you have to do is click enter. I apologize for the inconvenience. Happy entering and reading! Thanks, Jodi, Marcia, and Ang! :) It's super exciting to finally be holding it in my hand. Mmmmm. Historical fiction, middle-grade, and Civil War -- three of my favorite things. I'll be checking this one out! Thanks for the review and the giveaway. Uh, does Tom Sawyer and Huckleberry Finn count as Historical Fiction?? After Cathy's review, I may have to move this book up to the top of the pile for the next to read! The latest historical fiction novel I read was a spy novel set during WWII, The Proxy Assassin. I would love to read Margo's book. I'm a huge Civil War nut. I have many books in my collection--fiction and nonfiction. @Joyce: Vampire hunter--Maybe we should write something about George Washington and zombies. . . Dancing at the Shame Prom blog tour and giveaway!